Fuji Heavy Duty Drills are made with a sturdy construction. Their practical design represents Fuji's latest developments in drills technology. 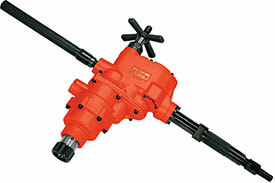 Fuji offers a complete line of drills with a drilling capacity range from 2 mm to 100 mm. The 5412053250 Fuji Standard FRD-100R-1 E Heavy Duty Drill is one of thousands of quality tooling products available from MRO Tools. Please browse Fuji Heavy Duty Drills for tools similar to the 5412053250 Fuji Standard FRD-100R-1 E Heavy Duty Drill. 5412053250 Fuji Standard FRD-100R-1 E Heavy Duty Drill description summary: Model: FRD-16Z-1C E Handle: Normal Roll Handle Drilling Capacity: 100mm/ 4'' Reaming Tapping: 100mm/ 4'' Stall Torque: 1823(N.m)/ 1345(ft.lb) Free Speed: 55min-¹ Socket: 5(M.T.#) Feed Length: 5.04'' Power: 3100(W)/ 4.15(hp) Overall Length: 23.6'' Quantity discounts may be available for the 5412053250 Fuji Standard FRD-100R-1 E Heavy Duty Drill. Please contact MRO Tools for details.